This chapter introduces the adopted notation and reviews the fundamental theoretical and mathematical concepts used throughout the thesis. 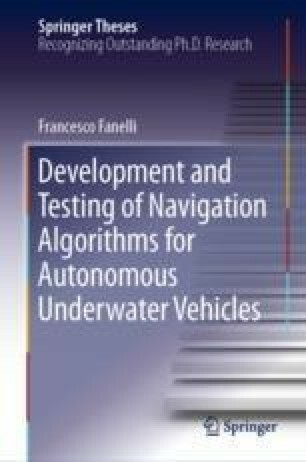 At first, the classical kinematic and dynamic modeling of an AUV is proposed, taking into account the presence of sea currents (Fossen in Guidance and control of ocean vehicles, 1st edn. Wiley, UK, 1994, ); then, the principles of Kalman filtering are reviewed (Kalman in Trans ASME J Basic Eng Ser D 82:35–45, 1960, ), with special focus given to the UKF (Bar-Shalom et al in Estimation with applications to tracking and navigation: theory algorithms and software. Wiley, 2001, ), (Julier and Uhlmann in Proceedings of the SPIE signal processing, sensor fusion and target recognition VI conference, vol 3068, 1997, ), which constitutes the basis for the position estimation filter developed during the Ph.D. period.